It’s the first of December again. Tomorrow I’ll light my first advent candle, and Christmas parties with friends and at work are less than two weeks away. December is a month we spend with others. Focusing on what happens around us, is not only good for others, but also for ourselves. Positive relations are a key element in happiness, and there’s research indicating that performing regular acts of kindness strengthens happiness. 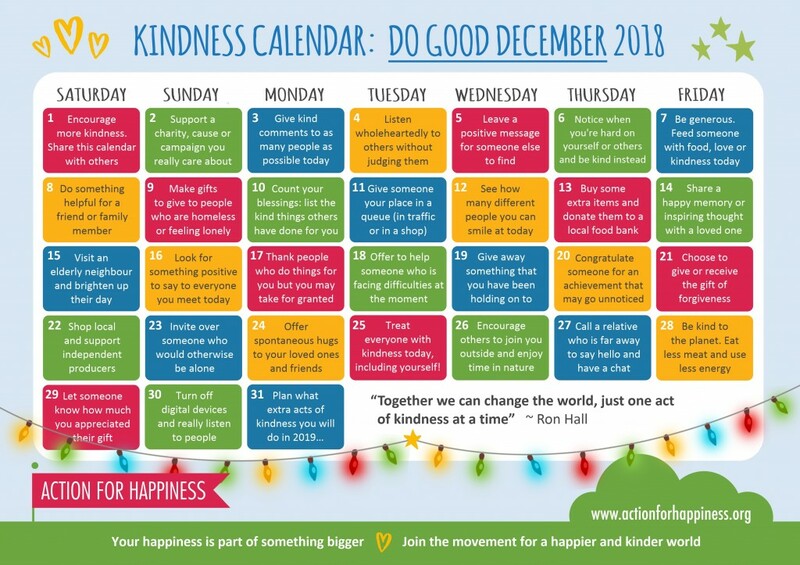 Like last year, I’d like to share the Kindness Calendar developed by Action for Happiness. 4 December: listen wholeheartedly to someone without judging them. This is a difficult one: when hearing about problems friends are facing, we are quick to offer advice, and in doing so, sometimes try to impose our views. 7 December: be generous. Feed someone with food, love or kindness today. And feeling happier is a great collateral benefit. 10 December: count your blessings: list the kind things others have done for you. I’ve written it often before: gratitude is an important factor in happiness. 17 December: thank people who do things for you but you may take for granted. It’s very easy to take things done for you for granted – by spouses, parents or friends. A friendly good morning or thank you in a shop or store or to the bus driver doesn’t hurt. Have a great and good December!